Soup is one of the best foods you can give your body, especially when it’s wet and cold outside and the soup contains ingredients that help your body stay healthy. This soup is one of those winter warmers and I often cook it for my family. 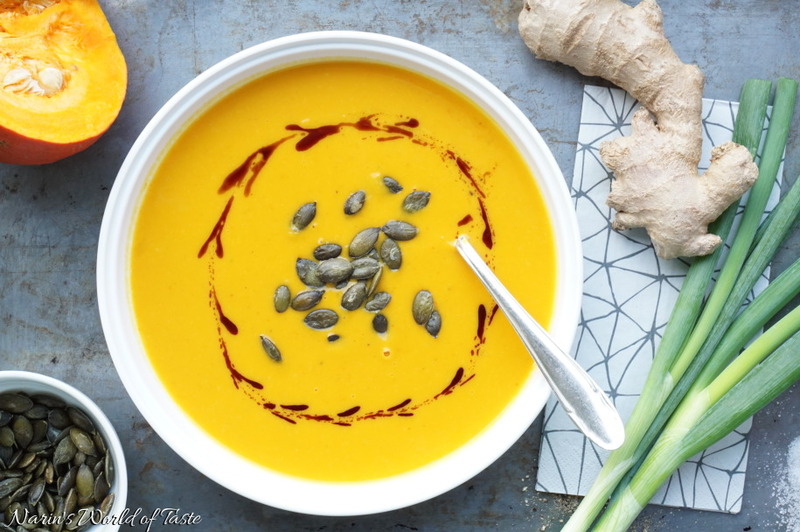 The delicate nutty flavor of the pumpkin and the spiciness of the ginger combined with the creamy potato and cream creates a very well balanced dish. Ginger has a lot of health benefits for your body, and during the cold season it will help boost your immune system. Peel the potatoes, and cut them into small pieces. Wash the spring onion stalks and chop them into rings. 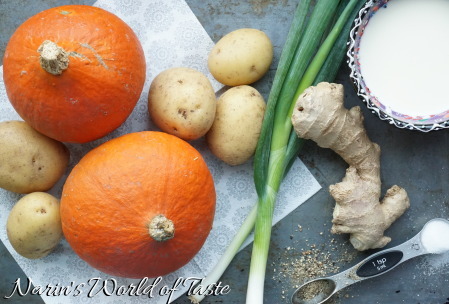 Peel the ginger (the most efficient way is to use a teaspoon instead of a knife), and then chop about 3 – 4 cm (about 1.5 inches) of its root. Cut the edges off the Hokkaido pumpkin and then cut it in half. Remove the inside with the seeds like in the picture above. You can do this best by using a tablespoon. 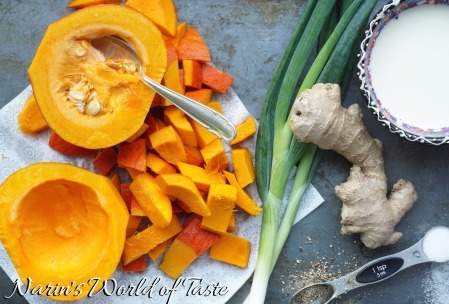 Wash the deseeded pumpkin and then cut it into small pieces (~ 2.5 cm / 1 inch). Depending on how spicy you like it, you can chop some chilies and add them (more spicy), add them completely (less spicy – but don’t forget to remove them in the step below), or leave them out. Heat the olive oil in a large pot and add the Hokkaido pumpkin, potatoes, spring onions, ginger, and chilies. Roast them a little bit by stirring continuously. Season with salt and pepper and add the water or vegetable stock. Reduce the heat and let it simmer for about 30 minutes or until the vegetables are soft. Remove the chilies now if you don’t like it too spicy. Puree the soup with a hand blender until smooth and add the cream. Season with salt and pepper to your taste. 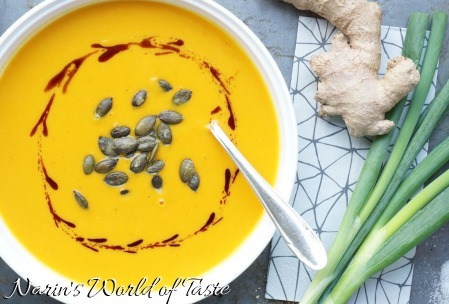 Serving: Serve the Pumpkin Ginger Soup in a soup plate or bowl, sprinkle with roasted pumpkin seeds, and drizzle about 1 tsp pumpkin seed oil around them.